The iPad Air is a fifth generation iPad tablet which was manufactured and launched by the US technology giant Apple in 2013 and has proven to be a remarkable hit till now. It's an ultra slim and a light weighted device which provides awesome display too. The iPad Air tablet houses powerful processor under the hood and enables fast processing to work with more efficiency at affordable price. It boasts an improved rear and front camera that doesn't just allow users to capture quality images, but also let them shoot better videos and playback them in various formats. The Apple iPad Air WiFi comes with many useful inbuilt apps to bring comfort and understands many languages. Let's have a look at the unique features, price, and outstanding specifications of this tablet that make it special and stand out of the crowd. The Apple iPad Air (Wi-Fi) looks stylish and has a sleek design. Despite having a large display, it feels premium in hand. The device ships in two colours Space Gray and Silver. The iPad Air is a retina ready device and features Multi-Touch 9.7-inch LED-backlit capacitive touchscreen with IPS technology and 71.6% screen to body ratio. The 1536 x 2048 resolution at 264 pixels per inch (ppi) along with 16M colours makes images lifelike and provides excellent visuals in bright outdoor. The oleo-phobic coating on the glass protects it from fingerprints and scratches. The dimensions of the Apple iPad Air are 240 x 169.5 x 7.5 mm and it weighs 469 grams (1 pound). The iPad Air WiFi packs in-built speakers and the lightning connector at the top. It has 3.5 mm jack and dual microphones at the bottom, and volume rockers along with the screen lock button on the left side at the bottom. The iPad Air tablet includes Three-axis gyro sensor, Digital compass, Accelerometer and Ambient light sensors. The Apple iPad Air Wi-Fi is equipped a power efficient A7 chip along with fast M7 motion co-processor coupled with Power-VR G6430 graphics and designed on 64-bit architecture. The iPad Air tablet comes with 1GB DDR3 RAM and provides a 16GB internal memory which cannot be expanded as it doesn't have a card slot to do so. The device supports multiple audio and video formats. One of the key factors of any Apple device is the Smart Digital Assistant Siri, which can respond to your voice and set reminders, play music or send messages to you without touching the tablet. People use the intelligence of Siri for more things and explore its exceptional service capabilities. The iPad Air WiFi supports iOS 7 and above and can be upgraded to the latest iOS 9.3.3. The stunning new potential and updates of this user-friendly OS affect your daily life and make it better. Quick-Type keyboard and Definition dictionary support is available for multiple languages. The range of Bilingual dictionary support and Spell check has also enhanced. Siri can understand English of US, UK, Australia, Canada, New Zealand, Singapore, and India. The Apple iPad Air WiFi can also respond in many other languages which make the device preferable for its global users. 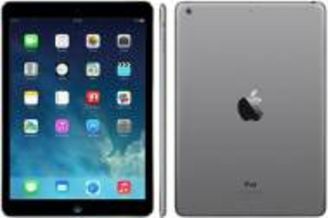 All its features will return an exact value of price that you spend on the Apple iPad Air tablet. Apart from Siri, built-in apps include Photos, Videos, Calendar, iTunes Store, App Store, Messages, Contacts, Music, Mail, Safari, Maps, iBooks, etc. The iPad Air also offer some free apps from Apple such as Pages, Keynote, GarageBand, iTunes U, Find My iPhone, iMovie, Find My Friends and Numbers.. The iPad Air 16GB (Wi-Fi) offers a 5MP iSight rear camera boasts a wide f/2.4 aperture with many exciting features like Autofocus, Face detection, Hybrid IR filter, Photo /video geotagging, Panorama, HDR and much more to take outstanding pictures and shoot high quality videos. 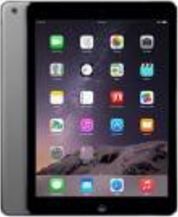 The Apple iPad Air WiFi tablet record up to 1080p HD videos and allow Video stabilization, Face detection, Backside flash, Tap to focus during the shoot and 3 times enlargement of the object. The tablet also comes with a 1.2MP front camera which makes it highly preferable for video calling and supports 720p HD videos. Standard features like image/video geotagging and face detections are also available with in a same price range. The iPad Air 16GB (Wi-Fi) sports a powerful inbuilt 32.4W lithium-polymer battery which is rechargeable via USB Power Adapter that comes along with the device. The company claims that it can last up to 10 hours with the mixed usage of surfing the web using Wi-Fi, watching videos and streaming music. You can use the internet through mobile network for 9 hours in one go. It includes standard connectivity options like Wi-Fi (802.11 a/b/g/n), MIMO, dual channel (2.4GHz and 5GHz) and Bluetooth 4.0. Users can also charge the device via computer using the USB cable. The device supports Nano SIM card. The tablet has a slim profile and can be handled with a single hand. The tablet is equipped with a powerful processor that provides fast processing. Retina Display allows user to view contently with less strain on the eyes. Powerful GPU enables immersive graphics. Few people may find it a bit pricey. The storage capacity of the device is limited to 16GB, and there is no option to expand it.